Across three books Nick Quantrill's Joe Geraghty series has put the city of Hull firmly on Britain's crime map, delving into the area's recession blighted streets and the pockets of tentative regeneration, the kind of places where a private investigator can operate more successfully than the police. The Crooked Beat sees Geraghty jobless and drifting, carrying the burden of his wife's death along with the cumulative weight of spent chances and broken personal connections. All he has left now is his family and they're about to be put under the cosh. Geraghty's brother Niall, in need of cash to get their father's pub up and running again, has unwisely involved himself in a cigarettes smuggling operation, taking a few quid to store a consignment until they can be picked up, but when the lock-up is broken into and the cigarettes stolen the debt falls on Niall and he's incapable of paying up or tracking down the theives. And this isn't the kind of situation where the rightful owner will shrug and walk away. It falls to Geraghty to get them back. While he's on the trail another job comes in. A local accountant, who he's worked for in the past, asks Geraghty to do some delving into his wife's movements; standard marital business Geraghty figures. The wife is the head of a literacy charity, seemingly the height of respectability but her past is anything but and links to some unsavoury characters begin to emerge, making Geraghty wonder if there might be more to the case than simple mistrust. The search for the stolen cigarettes takes Geraghty from Hull's bustling port to its seamy underbelly; decrepit terraces housing just as derelict people, seedy bars offering even seedier extras, run by small time gangsters all dancing to the tune of a the city's Mr Big, Frank Salford, a man who Geraghty has tangled with before, and whose business has already touched the Geraghty family with terrible consequences. As he gradually uncovers the scale of the smuggling operation it becomes clear that the only way out of the mess Niall has got them into is to take the full burden on himself. The British P.I. walks a very different beat to his American counterparts, the crimes are smaller, the guns and femme fatales thinner on the ground, but these limitations have led to a school of writing which is more character driven, less reliant on the old cliches and ultimately very satisfying. While Quantrill's Hull may lack the glamour of Los Angeles or New York it embodies the post-industrial decline common to many northern British cities, largely forgotten by politicians and left in the hands of gangster-businessmen. It's fertile ground for crime fiction and Quantrill has drilled deep into it across the Joe Geraghty trilogy, establishing himself as a major talent in the Brit Grit school. 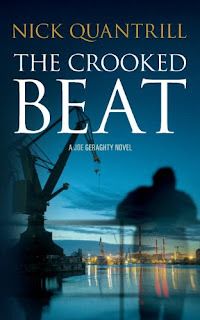 The Crooked Beat is a highly accomplished novel, written in terse prose which perfectly reflects the grubby brutality driving the plot and the character of Joe Geraghty, a good man caught up in bad business. This is a world where a victimless crime quickly snowballs into extreme violence, where nobody can be trusted, especially the police, and even the oldest bonds can be broken in a moment. I was hugely impressed with this book and the assured manner of Quantrill's writing. Whatever comes next for him I think he's going to be a name to watch. Agreed, he's gone from strength to strength. I read the first page of The Crooked Beat on Amazon. Unusual for a British thriller. I'm buying it.